Wet hops are hops that are freshly harvested and have not yet been dried or processed. These can be used for home brewing beer, but you need to make some adjustments to your recipe and expectations when using wet hops. Some time ago I wrote an article on the growing hops in the garden. 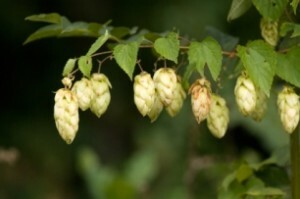 When you harvest your hop cones you typically will dry them right after harvesting to preserve them. All of the hops you buy from your local brew store are dried – typically down to a moisture level of 8-10%. However there is an alternative – using the hops right off the bine while they are still fresh. These hops are called “wet hops” or fresh hops. Wet hops contain 75-80% water by weight – enough to drip water if you squeeze them hard enough. Wet hops will spoil quickly so they should be used immediately after harvest. It is best if you can use them 24-48 hours after harvesting. It is difficult to get wet hops from hop growers unless you can make special arrangements. Some small breweries such as Sierra Nevada brew wet hopped beers, but they have the hops shipped overnight as soon as they are harvested in containers designed to provide proper ventilation for the hops. For home brewers, growing and harvesting your own wet hops is usually the best option. Your brewing schedule will be dictated by the hop harvest. Hops reach peak flavor for harvesting for only a few days, and since the hops need to be used immediately you’ll need to schedule around the harvest. Wet hops have a larger concentration of fresh plant material, which can result in more vegetal and even tobacco flavors. Chlorophyl and “green” flavors if used properly give the distinctive fresh hop flavor to the beer. However, the risk in 100% wet hopped beers is that these flavors can be overdone and spoil the profile for the beer. For this reason many brewers avoid using wet hops on very highly hopped beers like IPAs, while others embrace the green flavors as part of a fresh hopped beer. Commercial and home grown hops also don’t come with a hop analysis data sheet. There is always an element of mystery when wet hopping. The brewer is left to guess, based on the variety, what this season’s alpha content might be for a given wet hop. This means that targeting a bitterness level for your hops might mean picking a range of IBUs rather than a single number. Further complicating hop yield calculations is the fact that wet hops are mostly water by weight. So one ounce of wet hops is nowhere near the same as an ounce of dry hops. Most brewers use a rule of thumb, often derived from experience, to determine how much wet hops to substitute for an equivalent weight in dry hops. A good starting point is somewhere in the range of 6-8 – so you might use 6-8 times as much wet hops by weight to achieve the same bitterness as the equivalent dried hop weight. Wet hops can be used anywhere in the brewing process, including as a boil addition, whirlpool addition or for dry hopping. It is usually hard to both brew and dry hop with the same hops, however, due to the very short 1-2 day shelf life of the hops itself. However some brewers have experimented with dry hopping during primary fermentation, which might be an option if you are trying to brew and dry hop with your freshly harvested home grown variety. It is not uncommon to mix wet and dry hops when brewing. For example you could boil with regular dried hops from the store, and use fresh hops for “dry hopping”, or mix varieties bought from the store with your home grown fresh hops. Are wet hops for everyone? Well clearly not everyone has access to freshly picked hops or the ability and time to grow hops in their garden. However, fresh hops can add exciting fresh flavors to your beers once a year and also offer a unique challenge to the brewer and hop grower. I noticed you do not have a “wet hop” option in beer smith. How do you suggest adding and compensating for them in a recipe? I’m using them post boil only in a whirlpool. Here’s an article on using them: http://beersmith.com/blog/2016/03/22/using-fresh-wet-hops-in-home-brewed-beer/ — However they are not used all that often and the effects can be achieved by setting a lower alpha value to compensate for the low alpha yield (per unit of hop weight) so I’m not convinced it really needs to be a separate feature. Just set the alpha level much lower than normal. Thanks Brad, I reduced the alpha value by 50%. Will see how this works out! Grassy Off Flavors in Residence Brewed Beer - Talking About Craft Beer And Traveling The World.